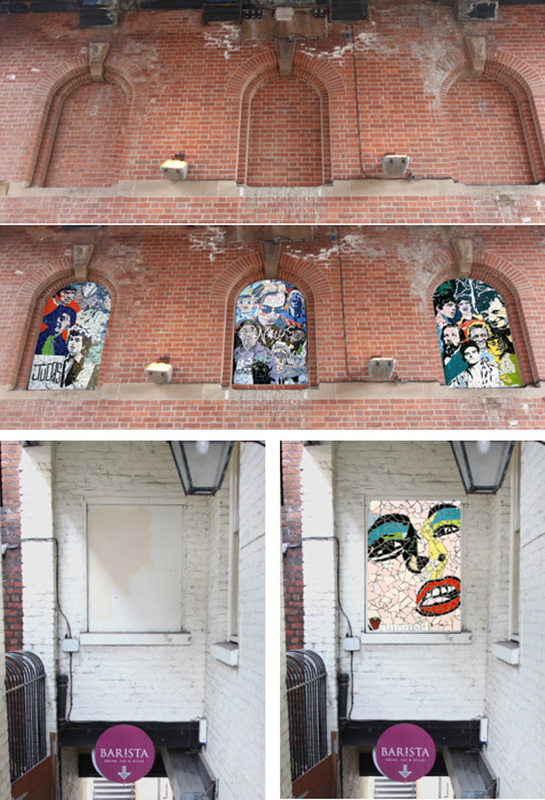 We want to radically transform the visual landscape of the area by putting a series of public art projects into action. The story of Stockport would be told in an extremely visual and engaging way through the creation of colourful murals, mosaics, graffiti art and street art. These pieces of public art would be created in a collaboration between professional local artists and the town’s community arts groups, residents and creative young talent from schools and colleges. Through directly involving the local community in this project, we hope it will give people a sense of pride and ownership about the art and about the area in general. 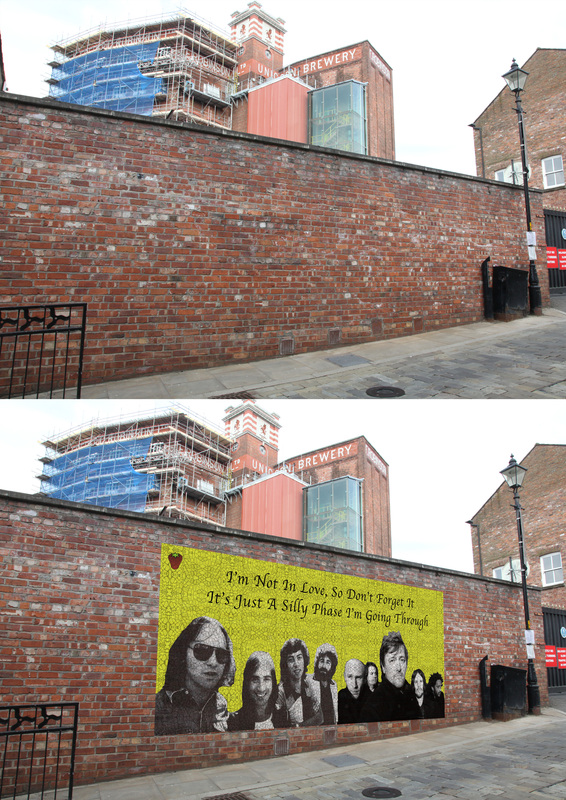 The theme of the artworks would be based around Stockport’s rich cultural, musical, social and political history, sharing the town’s legacy with the next generation. 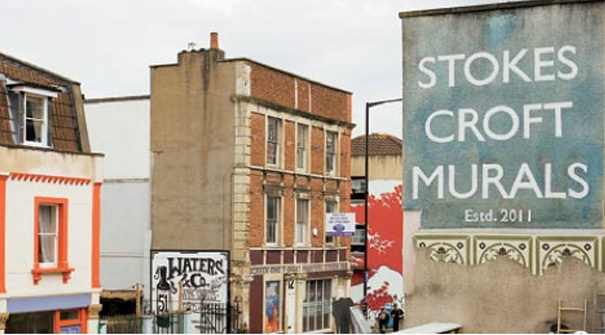 This idea of transforming the surroundings of an area with street art has been incredibly successful in both Manchester’s Northern Quarter and Bristol’s Stokes Croft area, as you can see below. Art regeneration to improve the aesthetic of an area is not a new thing. 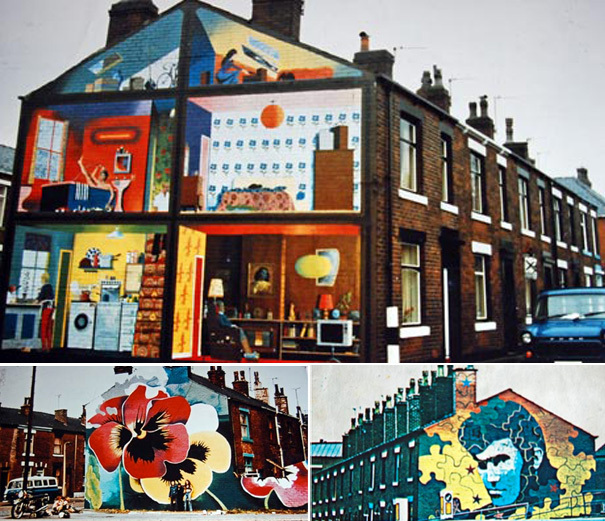 The mural artist Walter Kershaw was regarded as the first ever ‘graffiti artist’, after he started painting houses and buildings in Rochdale in the 1970s which reflected a truly Northern way of life, which you can see below. The architecture of the Market and Underbanks area really lends itself to this type of artwork, with large brick walls and blocked up windows making the perfect blank canvas. Here we have shown what the area currently looks like, and what it could potentially look like. 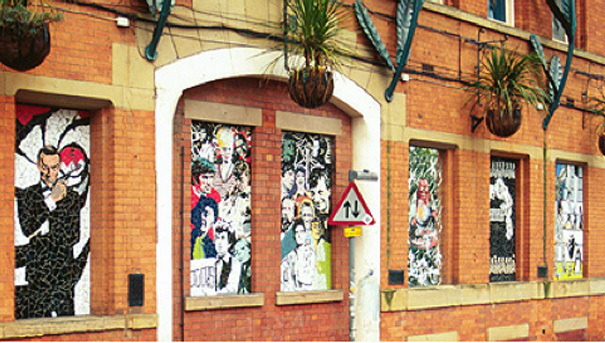 A project Screen Stockport is passionate about is the promotion of the musical legacy of Stockport’s Strawberry Studios, through a music project and series of mosaic artworks. 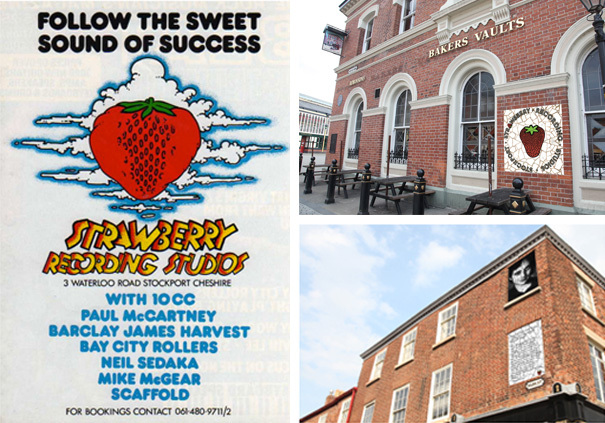 Here’s how mosaics of the Strawberry logo and the legendary producer Martin Hannett might look on buildings in the Market area. The studios played a huge part in both Stockport and Manchester’s musical legacy, here’s 10cc’s Eric Stewart and producer Martin Hannett mixing at Strawberry. Stockport also has a proud history of people from the town standing up for their rights against social injustice and inequality. These images could be used as inspiration for street art, acting as a legacy for the story of these revolutionary struggles. The Bull’s Head pub in Stockport Market was a rallying point for residents in Stockport who fought for their right to vote in The Peterloo Massacre, led by Henry ‘Orator’ Hunt, as shown in the image on the left. Artists from Stockport have already been involved in some really interesting street art regeneration projects, including graffiti artist Rik Cheetham, aka ALTO All Weather Artist, and artist and illustrator Tracey McGuiness Kelly. 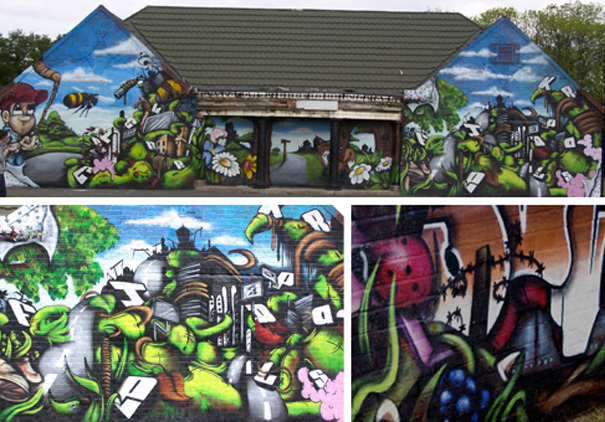 Rik Cheetham worked on this graffiti artwork below at Cringle Fields, an inner City Park in Levenshulme, which went on to achieve its Green Flag Award on the strength of the artwork. 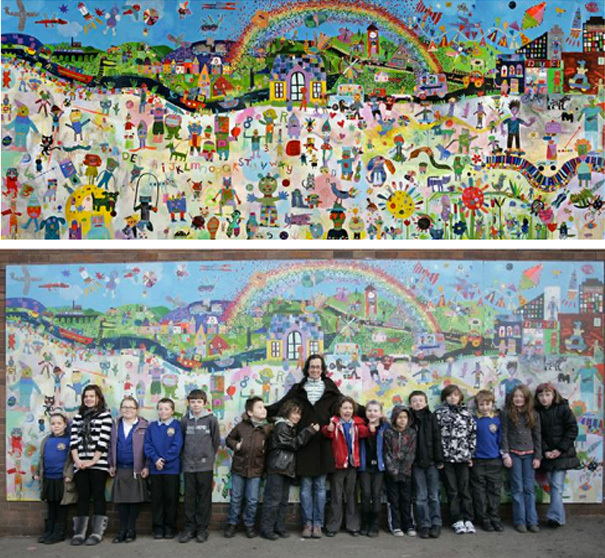 This mural below was created by Tracey McGuiness Kelly in collaboration with the children and parents of All Saints’ Primary School. These type of community driven creative projects, involving young and old people alike, are crucial to the regeneration of Stockport’s Market and Underbanks area. Feel free to add your thoughts and opinions in the comments. What a fantastic idea. Not only would this brighten up some dismal walls, brows and stairways, it would also highlight the architecture. It might also increase pride in the history and achievements of the town. When people feel pride in an area they visit it more often. They want to sit around it and admire it over a latte. I particularly like your examples of what could be done in the bricked up arch windows on Little Underbank. What was that building under the St Petersgate Bridge anyway? It would be great to have a Smiths’ Hand in Glove murial knocked up somewhere before May 13th. Perhaps a painting of the old Empire Theatre somewhere near St Peter’s Square or a artistic reminder of the trams. How about a mosiac of the viaduct saying, “27 arches, 600 men, 21 months, 11 million bricks…what ambition! I could go on all night.